Petersen, P. C. and Berg, R. W. (2017). 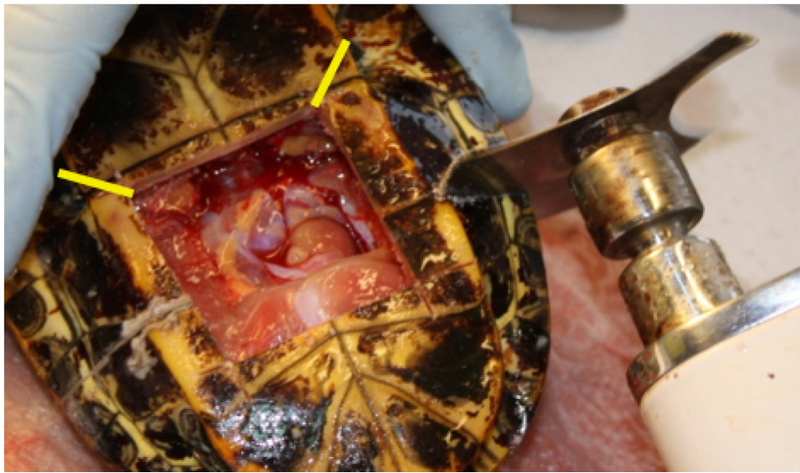 Spinal Cord Preparation from Adult Red-eared Turtles for Electrophysiological Recordings during Motor Activity. Bio-protocol 7(13): e2381. DOI: 10.21769/BioProtoc.2381. Petersen, P. C. and Berg. R. W. (2016). Lognormal firing rate distribution reveals prominent fluctuation-driven regime in spinal motor networks. eLife 18805. Although it is known that the generation of movements is performed to a large extent in neuronal circuits located in the spinal cord, the involved mechanisms are still unclear. 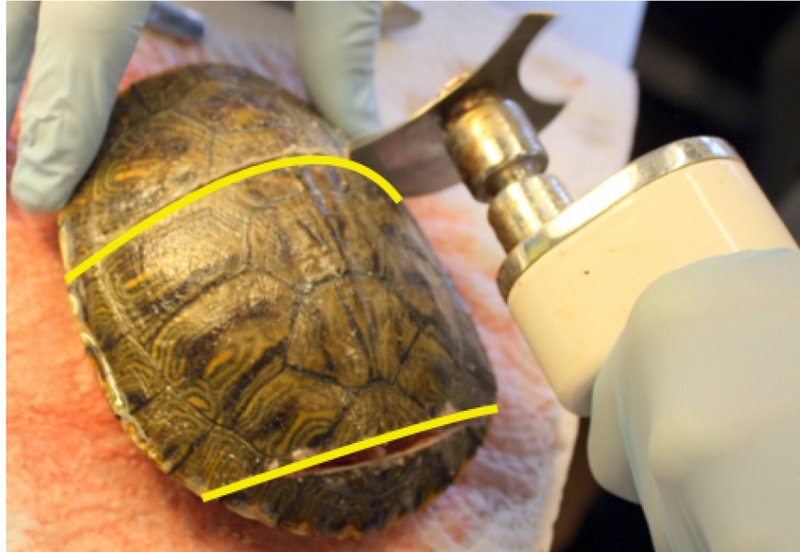 The turtle as a model system for investigating spinal motor activity has advantages, which far exceeds those of model systems using other animals. The high resistance to anoxia allows for investigation of the fully developed and adult spinal circuitry, as opposed to mammals, which are sensitive to anoxia and where using neonates are often required to remedy the problems. The turtle is mechanically stable and natural sensory inputs can induce multiple complex motor behaviors, without the need for application of neurochemicals. 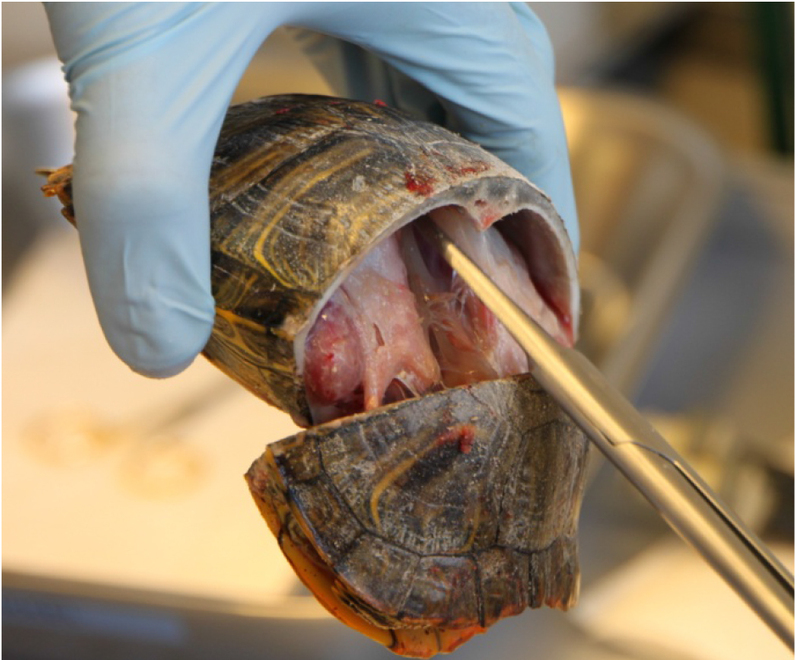 Here, we provide a detailed protocol of how to make the adult turtle preparation, also known as the integrated preparation for electrophysiological investigation. Here, the hind-limb scratch reflex can be induced by mechanical sensory activation, while recording single cells, and the network activity, via intracellular-, extracellular- and electroneurogram recordings. The preparation was developed for the studies by Petersen et al. (2014) and Petersen and Berg (2016), and other ongoing studies. The investigation of spinal electrophysiology has traditionally been associated with mechanical complications due to the many moving parts and the flexibility of the spine. 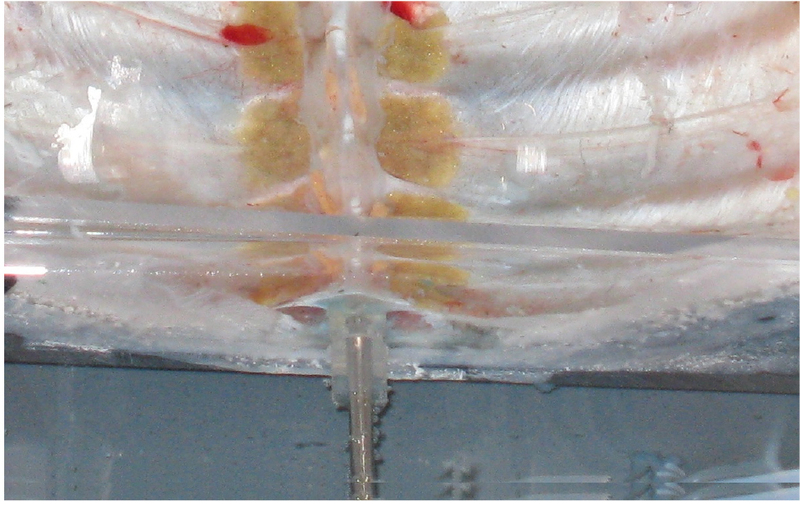 To circumvent this issue, the spinal cord has often been dissected out of the column and moved to a chamber where stable electrophysiological recordings can be performed. Nevertheless, this procedure has shortcomings, for instance, it is complicated to properly activate the motor circuitry especially if multiple motor behaviors are to be investigated. Furthermore, the absence of blood supply and lack of oxygen has serious ramifications on the health and integrity of the circuitry. An experimental model, which can circumvent all these issues, is the turtle preparation (Keifer and Stein, 1983). Here, one can study not only the fully developed vertebrate spinal cord, but also several different types of complex motor behaviors without the need of neuro-active substances such as glutamate agonists, 5HT, and dopamine. Since the neurons in the turtle central nervous system are able to perform anaerobic metabolism, the integrity of the circuit remains for much longer than in the mammalian experiments. Last, the turtle carapace organization allows stabile multi-electrode recordings of unprecedented quality. 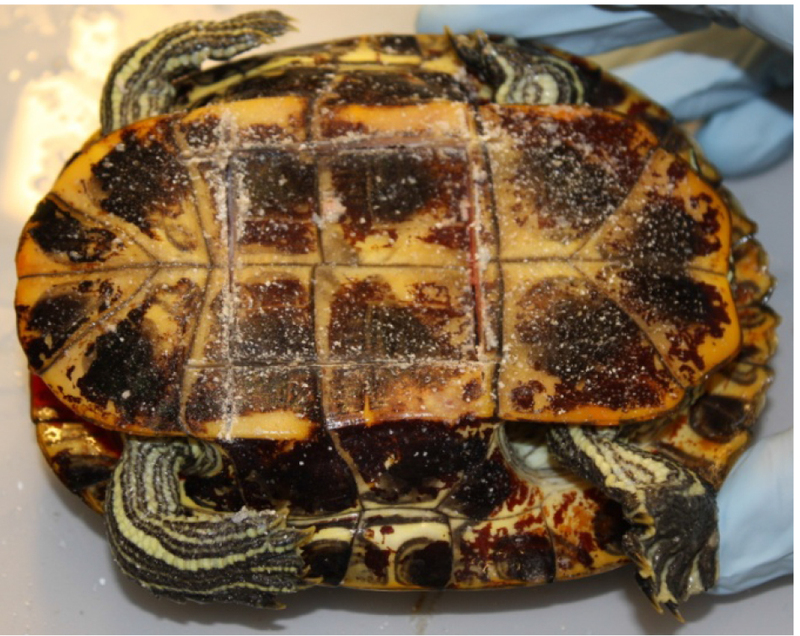 Here, we provide a detailed protocol for setting up the integrated adult turtle preparation, sometimes called the ex vivo preparation (Guzulaitis et al., 2014), with intact spinal motor network. The preparation provides the opportunity for measurements of the central pattern generator in the lumbar spinal segments (Figure 1), which is similar to the lumbar spinal cord of mammals and other animals (Walloe et al., 2011). This preparation includes the spinal segments D3-S2 en bloc. Measurements of the scratch reflex can be performed entirely in the absence of chemical anesthesia. Intracellular, as well as high-density extracellular recordings, can be acquired in the spinal cord concurrent with both ipsilateral and contralateral electroneurogram recordings of muscle nerves (ENG). The scratch reflex is induced by mechanically touching the ventral side of the carapace and therefore identical or close to a natural behavior. A smaller version of the integrated turtle preparation was introduced by Keifer and Stein (1983) and subsequently adapted and modified (Currie and Lee, 1997; Alaburda and Hounsgaard, 2003; Alaburda et al., 2005; Berg et al., 2007 and 2008; Kolind et al., 2012; Vestergaard and Berg, 2015). The present preparation was developed for the study by Petersen et al. (2014) and Petersen and Berg (2016) where electrode arrays are inserted perpendicularly into the lumbar spinal cord (Berg et al., 2009). The preparation steps can be split into two parts, typically performed over two days. First part can be performed without a microscope. All procedures of the first part are completed over 3 h. The first 2 h to induce anesthesia and the last hour for dissection. The procedures of the second part can be performed at a setup using a microscope and will take about an hour to complete. Figure 1. 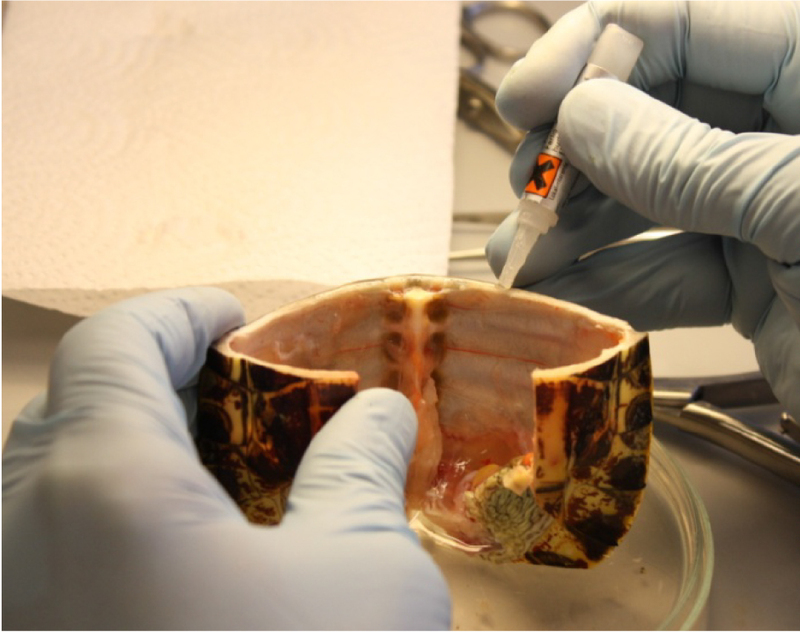 The integrated adult-turtle preparation with implanted electrodes. A. Schematic of the placement of the silicon probes in the spinal cord; B. The preparation with three silicon probes and intracellular glass electrode. Suction electrodes for electroneurogram recordings are attached (pointing from top and bottom and right and left). C-D. Close up of the spinal cord with silicon probes and intracellular glass electrode (only inserted in the spinal cord in D). The tips of suction electrodes are also visible. Modified from Petersen and Berg (2016) with permission. E. The spinal cord after the silicon probes have been retracted. Blue DiD markings are visible from the first and third shank (8 markings for each of the probes, highlighted with arrows). Note: The surgical procedures comply with Danish legislation and were approved by the controlling body under the Ministry of Justice. To induce hypothermic analgesia, the turtle is submerged in crushed ice in a bucket. Full induction of anesthesia takes about two hours. Prepare 2 L of cold Ringer’s solution (see Recipes) (5 °C) for the first day. Cold Ringer’s solution is used to keep the turtle anesthetized during the preparation. Tools: Toothed Tissue Forceps, large pliers, large scissors, small scissors, cast saw cutter, cast cutter blade, perfusion system, plastic bag, gloves. Prepare perfusion-system: Fill the glass bottle with 500 ml Ringer’s solution and close the lid. Connect the bottle to a compressed air system/outlet. Turn on the compressed air and let the perfusion-system run for 30 sec with a flow above 120 ml/h as measured with the flow meter. Stop the flow. Take the turtle from the ice bath. Two conditions must be met to ensure that the turtle is fully anesthetized: 1) Its eyes must be closed and 2) No pedal withdrawal reflex response. Proceed, when the anesthesia is confirmed. 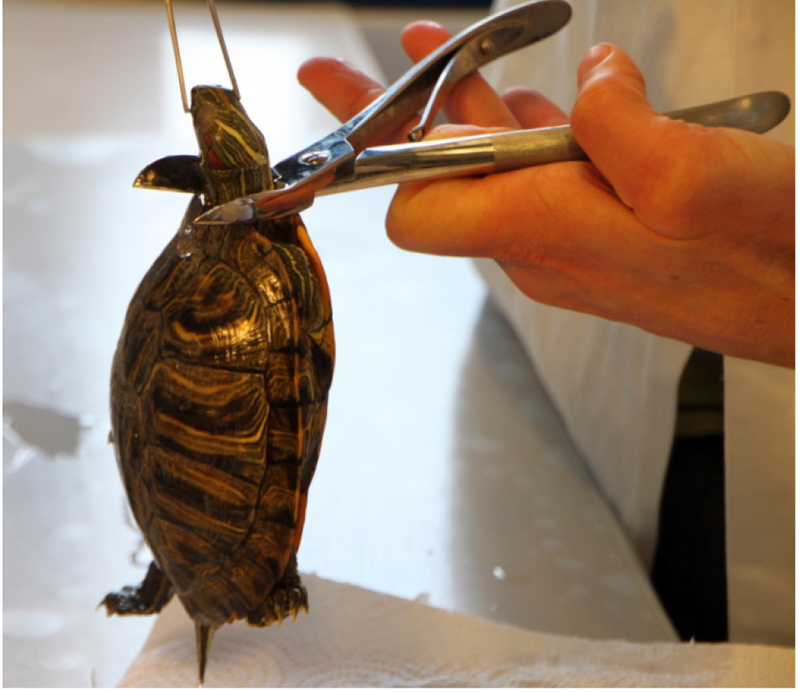 Pull out the head of the turtle with the toothed Tissue Forceps to allow for decapitation. Hold the head in place with the large pliers (Figure 2), and cut the neck with the large scissors. Figure 2. Decapitation of anaesthetized turtle. Head is held in place with the toothed tissue forceps and large pliers. The large pair of scissors is used for the decapitation. Crush the head with the large pliers and dispose of it in the plastic bag. Note: Now that the turtle is decapitated the dissection can begin. In the next steps, you will perfuse the cardiovascular system with cold Ringer’s solution, by injecting Ringer’s solution through the heart of the turtle. This removes blood and cools the nervous tissue. Place the turtle on its back, and use the cast saw cutter to make a square opening in the plastron. The location of the four cuts is shown in Figure 3. The two cuts, orthogonal to the spinal cord, are oriented along the edges of the two central scutes (smaller plates). Keep the minimum distance between the cuts, parallel to the midline, above 5 cm. Make sure that the square cutout plastron is completely released with the cast saw cutter before continuing. Verify this by gently pushing on the inner corners of the cut-out plastron, if the square piece moves freely it is sufficient. Figure 3. The square cut in the plastron has been performed. Gently push in the inner corners of the square cut-out plastron to verify that it is released. Lift up the cutout plastron with the Graefe forceps and use the scalpel to carve it free from the soft tissue. Gently lift up the pericardium, the fine ‘pellicle’ containing the heart, with the Graefe forceps and cut it open with the fine scissors, to get access to the heart (Figure 4). Figure 4. 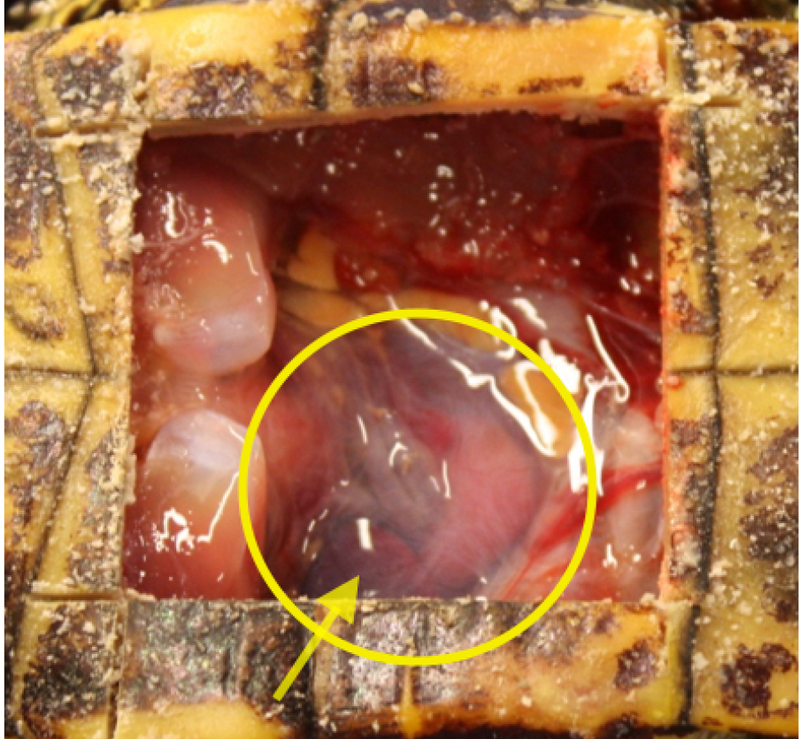 The internal view of the window hole in the plastron of the turtle. The heart is marked by the circle and the right atrium by the arrow. Locate the ventricle and the atriums of the heart (the heart and the right atrium is marked by a yellow circle and an arrow in Figure 4). Cut a hole in the right atrium (located on the left and highlighted in Figures 4 and 5) with the fine scissors, and insert the perfusion needle into the center of the left part of the ventricle (Figure 5). Adjust the flow to a range around 75-130 ml/h, accordingly to the heart rate: When inserting the perfusion needle into the heart, the heart rate should increase dramatically at first, but stabilize at a pace around 20-40 bpm. If the heart rate is not in this range adjust the flow accordingly: increase the flow if a lower heart rate is observed, and decrease the flow if the heart is pumping too fast. Note: Perfuse the turtle for about 10 min. Monitor the perfusion by checking outflowing liquid from the right atrium; as this becomes colorless the perfusion of the turtle is complete. Figure 5. The perfusion needle is inserted into the left part of the ventricle of the heart. The right atrium and ventricle are marked by the arrow and the circle respectively. Perform a rostral and a caudal transverse cut in the carapace orthogonal to the spinal cord. Place the turtle with the carapace facing upwards (dorsal side up). Figures 18 and 19 show the spinal segments and associated nerves. 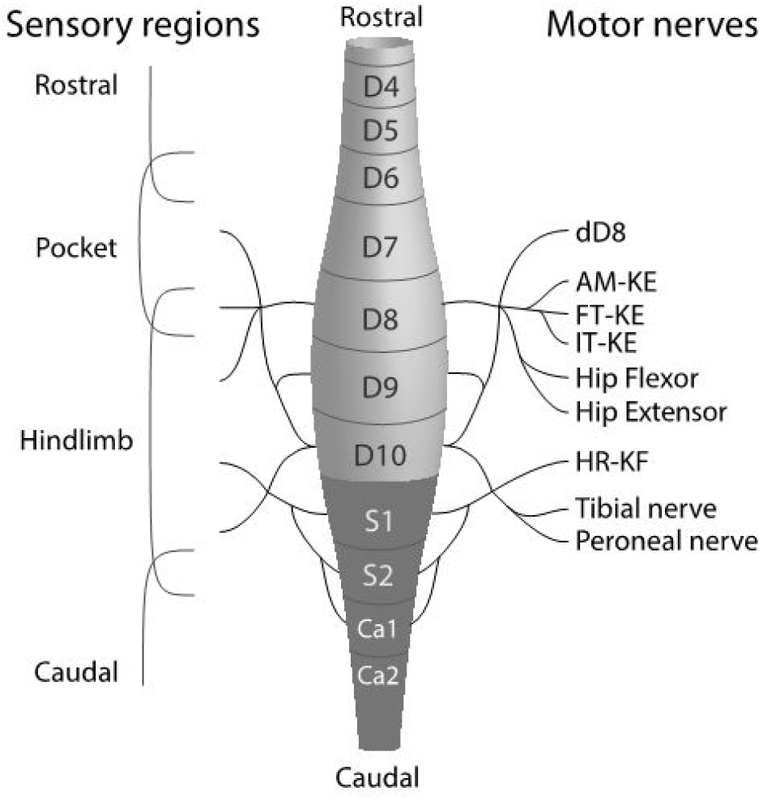 The central pattern generator is located in the spinal segments D8-D10 (Mortin and Stein, 1989; Mui et al., 2012; Hao et al., 2014), and the sensory input for the scratch reflex comes from every segment from D3 to S2 (Figure 18, excluding caudal scratching). In order to keep the sensory input to the network intact, the rostral cut is made between D2 and D3. The caudal cut is done between S2 and Ca1. The two cuts are seen in Figure 6. D2-D3 is located halfway along the 2nd central scutes and S2-Ca1 halfway along the 5th central scute (Mortin and Stein, 1990). It is important that the cuts are a) orthogonal to the spinal cord, b) performed in one cut all the way from the midline of the carapace to the cut edge of the plastron, since the perfusion through the spinal column must be sealed tight. The caudal cut should be angled perpendicular to the curvature of the carapace. Figure 6. Performing the rostral cut. The caudal cut has already been done. The rostral cut is done along the center of the first central scute, and the caudal cut along the center of the fifth central scute. When the two cuts have been made, the carapace is separated from the remains of the caudal part of the plastron. This separation is obtained with two diagonal cuts at the corners of the squared window in the plastron (the two yellow lines in Figure 7). Figure 7. The rostral cut at the ventral side (through the plastron). The two diagonal cuts are highlighted in yellow. Tools: Large scissors, 1 L beaker with cold Ringer’s solution. Hold up the turtle with the caudal part upwards. 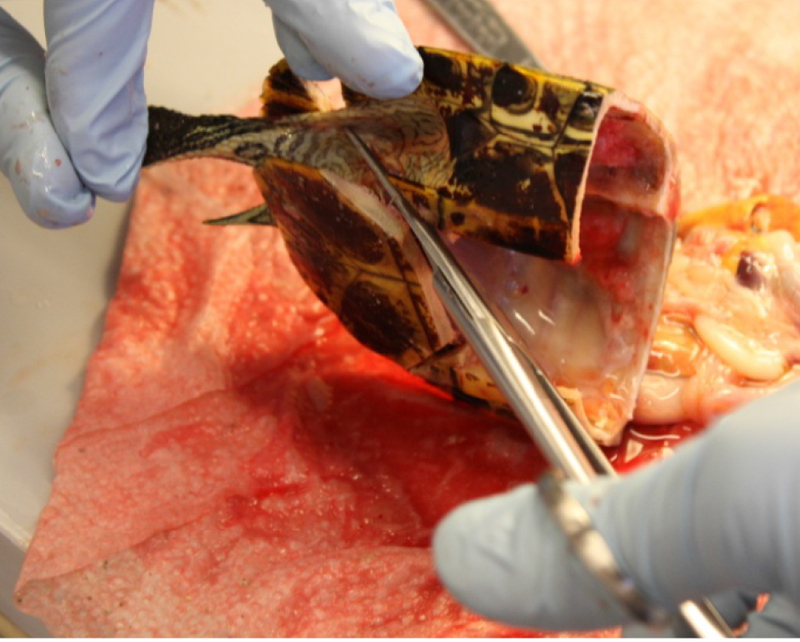 Take the large scissors and cut the internal organs free of the carapace by cutting the thin membrane holding the organs in place along the inner side of the carapace from below and up (Figure 8). It is easier to cut along the carapace when the internal organs hang loose. Try to maintain the organ block in one piece when removing it. Cut the large head retraction muscle that inserts along the spine, and cut the remaining organs free along the carapace as far up as possible. Pull back one of the hind legs. Make an incision with the large scissors in the soft skin along the plastron (Figure 9). Begin from the diagonal cut made previously in the plastron, and aim towards the leg. Cut the thigh bone (femur) about 1 cm from the carapace (Figure 10). Repeat step A5d for the other hind leg. 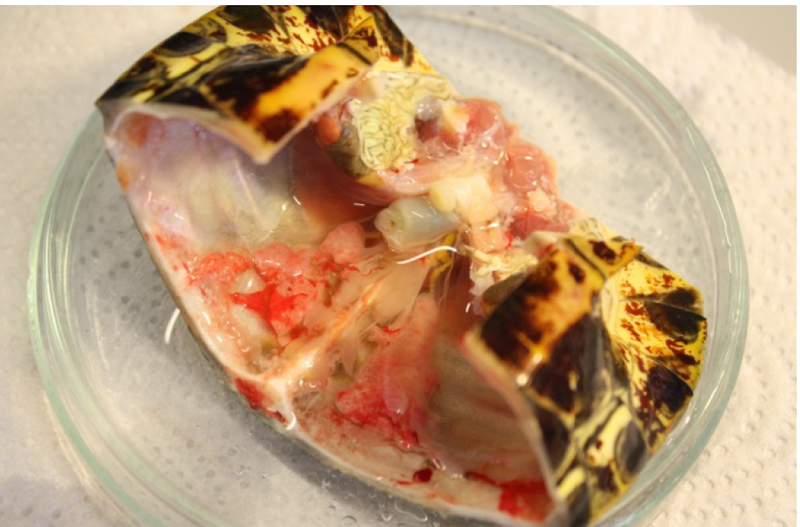 Cut the plastron and the caudal end of the carapace free without damaging the spinal cord. The preparation is now left in a Petri dish in cold Ringer’s solution (Figure 11). Clean off excessive blood from the preparation by quickly rinsing it in cold Ringer’s solution (about 50 ml) and place it in a 1 L beaker with cold Ringer’s solution when done. Tools: Graefe forceps, curved forceps, scalpel. 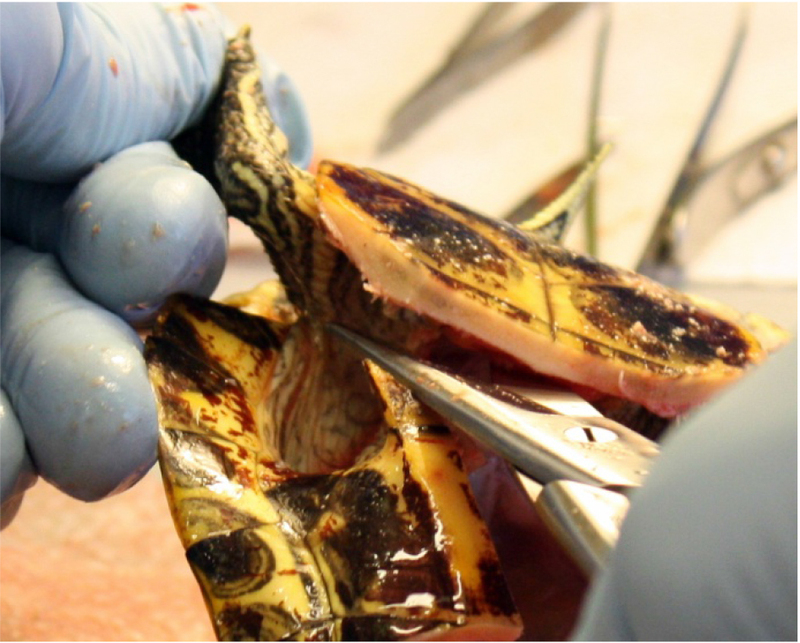 The muscles and connective tissue covering the vertebra has to be removed carefully with a scalpel and forceps. The muscles tissue is carefully scraped off until the vertebra is fully exposed while leaving the nerves intact (Figure 12A). Figure 12. The exposed spinal segments S1-Ca1 and the rostral transection. A. Ca1 and more caudal segments are all flexible segments, while D10 and more rostral segments are joined with the carapace. The yellow square highlights the segments. B. Rostral transection of the spinal cord with the rotary cutter blade to make the vertebra smoother, such that the tubing makes a tight seal. Area indicated by the yellow square, and location of second cut compared with the initial cut is indicated by the parallel lines. Tools: Sharpened rotary cutter blade mounted in the cast saw cutter. To minimize damage to the spinal tissue, a special sharpened rotary cutter blade (Olfa, rotary cutter blade 45 mm) has been produced to transect the spinal cord with the cast saw cutter. At the spinal transection, the spinal cord retracts slightly into the spinal column. Therefore, perform the transection of the spinal cord in a firm and quick movement to get a smooth cut surface. Mount the rotary cutter blade in the cast saw cutter. Insert the edge of the blade into the cold Ringer’s solution in the Petri dish for ten seconds to cool it down. This will improve the quality of the spinal transection. Perform the rostral transection of the spinal cord about 1-1.5 mm from the previous cut. The transection must be perpendicular to the spinal cord (Figure 12B). Rotate the preparation 180° in the coronal plane and mount it in the clamp. Perform the caudal transection of the spinal cord. The second cut provides an improved perfusion. Put the preparation back in the glass beaker in Ringer’s solution. Tools: Cyanoacrylate adhesive, Plexiglas plate, Petri dish with lid, ice, scalpel, perfusion system, paper towel. Put a layer of ice in the largest Petri dish and place the smaller Petri dish on top of the ice, facing upwards, and fill it with cold Ringer’s solution. Place the preparation in the cold Ringer’s solution with the rostral end facing upwards. Dry the cut rostral carapace edge with a paper towel. Apply a thin layer of cyanoacrylate adhesive along the cut edge that will be the area of contact with the rostral Plexiglas plate (Figure 13). Be careful not to get adhesive into the spinal column, which will obstruct the flow of Ringer’s solution. Figure 13. Applying adhesive to the rostral cut of the preparation. Put a fine line of adhesive along the cut corresponding to the contact area of the Plexiglas plate. Gently place the rostral Plexiglas plate on the preparation centered with the small hole over the cut spinal cord (Figure 14). Keep it firmly in place for about 30 sec. If the adhesive does not harden, apply some drops of Ringer liquid on the glue, which will help harden, while holding the plate in place. Lift up the preparation and place an extra line of glue along the line of contact between the dorsal carapace and the Plexiglas. Leave it to dry for one minute before continuing. Tools: Cyanoacrylate adhesive, Plexiglas container, paper towel. 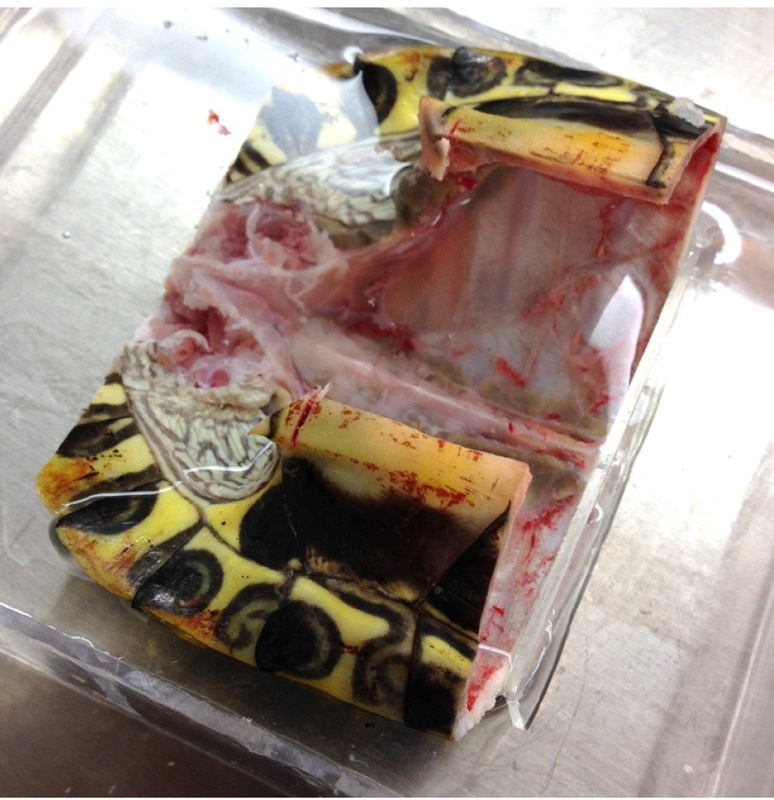 Take the Plexiglas container and place glue at the four contact points of the caudal carapace. Gently place the turtle preparation in the Plexiglas container (Figure 15). Keep it in place for about 30 sec. Gently fill the Plexiglas container with Ringer’s solution. The liquid will help harden the adhesive. Place the preparation in a larger plastic container and immerse it completely in Ringer’s solution. The procedures of the first part are now complete. Leave the preparation overnight in a refrigerator. Mount the steel tube and a silicone gasket to the hole in the Plexiglas plate. Press the gasket against the D4 vertebra, and push in the steel tube to obtain a tight seal (Figure 16). Connect the tube to a raised container with Ringer’s solution. Maintain a perfusion flow above 300 ml/h by adjusting the relative vertical position of the container with Ringer’s solution. Tools: Finely serrated scissors, fine scissors, Graefe forceps, Dumont #5 forceps and Dumont #7 curved forceps. Other needs: 2 L of Ringer’s solution. Identify the motor nerves originating from D8-S2 and dissect them free for ENG-recordings (Figures 17A and 18). 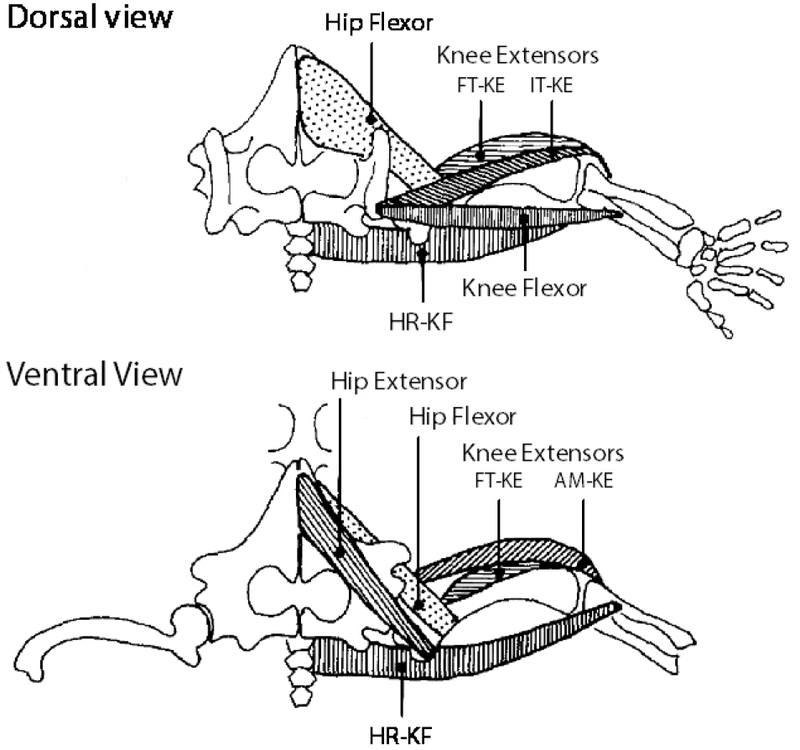 Figures 18 and 19 show the location of the nerves and corresponding muscles respectively: Hip-flexor, Hip Extensor, three Knee-extensors (FT-KE, IT-KE and AM-KE), dD8 and HR-KF (Mortin and Stein, 1990). 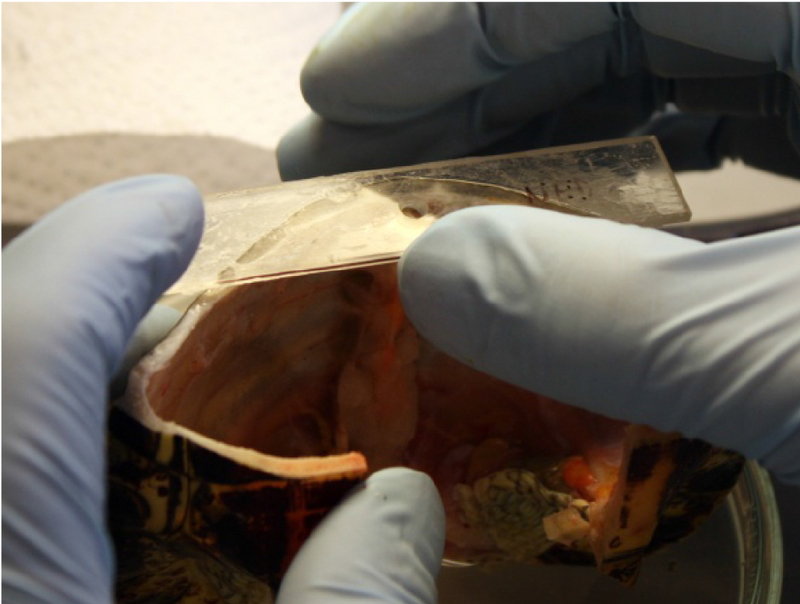 Muscle tissue along nerves should be dissected free to minimize noise in the ENG recordings. The nerves are robust but can easily be damaged during the dissection without obvious visible signs. Gently cut out the muscle tissue and free the nerves. A good technique to free the nerves from surrounding tissue is to place the tip of the fine scissors in the tissue close to the nerve and pull the sharp edge distally along the nerve. Note: Figures 1B-1E show the finished preparation, mounted in the Plexiglas container and immersed in Ringer’s solution. The nerves dissected free are clearly visible as white branches originating at the spinal cord and going towards the hind limb muscles. Glass electrodes are used for the ENG recordings. Apply a slight negative pressure, and prepare the glass opening to fit the respective nerves you want to record. Figure 17. Electrophysiological recordings and histological verification. 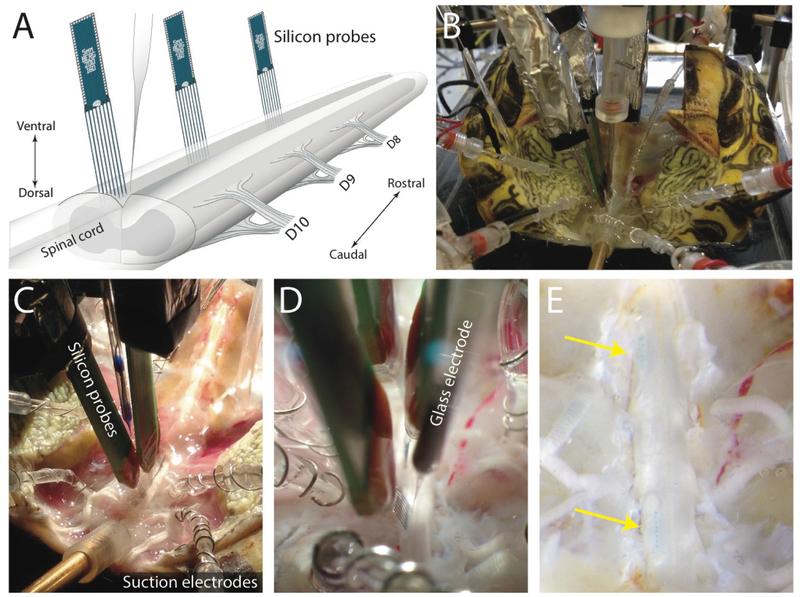 A. Intracellular and ENG recordings; B. Rastergram of ~200 extracellular units recorded with high density silicon probes; C. Histological verification of the location of shanks of the silicon probe; D. DiD is painted on the electrode before implant. ChAT and Nissl stains are applied as markers for motoneurons and neurons respectively. Sagittal and coronal slices in respectively C and D. Scale bars = 500 µm. Adapted from Petersen and Berg (2016). Figure 18. The sensory and motor nerves along the spinal cord. Adapted from Petersen et al. (2014) with permission. Figure 19. Major muscle groups of the hind-limb. Hip flexor, Hip Extensor, Knee Extensors (FT-KE, IT-KE, AM-KE) and Knee flexor (HR-KF, extend across both the hip- and the knee-joint). Reproduced from Bakker and Crowe (1982) with permission. Tools: Fine forceps, fine Rongeur, fine scalpel, syringe needle tip (size: 27 G). Using the fine Rongeur, open the spinal column on the ventral side along the segments D8-D10. Gently remove the dura mater with scalpel and forceps. For each insertion site for the silicon probes, open the pia mater with longitudinal cuts along the spinal cord with the tip of a bent syringe needle tip (size 27 G). Perform the cuts parallel to the ventral horn between the ventral roots, as superficial as possible (Figure 1E). This completes the procedures to make the integrated preparation. Figure 17 shows example electrophysiological recordings and histology (Petersen and Berg, 2016). Note: Either Ringer’s solutions can be used in this protocol. Funded by the Novo Nordisk Foundation (RB), the Danish Council for Independent Research Medical Sciences (RB and PP) and the Dynamical Systems Interdisciplinary Network, University of Copenhagen. Thanks to J. K. Dreyer and J. Hounsgaard for reading and commenting an earlier version of the manuscript. Alaburda, A. and Hounsgaard, J. (2003). Metabotropic modulation of motoneurons by scratch-like spinal network activity. J Neurosci 23(25): 8625-8629. Alaburda, A., Russo, R., MacAulay, N. and Hounsgaard, J. (2005). Periodic high-conductance states in spinal neurons during scratch-like network activity in adult turtles. J Neurosci 25(27): 6316-6321. Bakker, J. G. M. and Crowe, A. (1982). Multicyclic scratch reflex movements in the terrapin Pseudemys scripta elegans. J Comp Physiol 145:477-484. Berg, R. W., Alaburda, A. and Hounsgaard, J. (2007). Balanced inhibition and excitation drive spike activity in spinal half-centers. Science 315(5810): 390-393. Berg, R. W., Chen M. T., Huang, H. C., Hsiao, M. C. and Cheng, H. (2009). A method for unit recording in the lumbar spinal cord during locomotion of the conscious adult rat. J Neurosci Methods 182(1): 49-54. Berg, R. W., Ditlevsen, S. and Hounsgaard, J. (2008). Intense synaptic activity enhances temporal resolution in spinal motoneurons. PLoS One 3(9): e3218. Currie, S. N. and Lee, S. (1997). Glycinergic inhibition contributes to the generation of rostral scratch motor patterns in the turtle spinal cord. J Neurosci 17(9): 3322-3333. Guzulaitis, R., Alaburda, A. and Hounsgaard, J. (2014). Dense distributed processing in a hindlimb scratch motor network. J Neurosci 34(32): 10756-10764. Hao, Z. Z., Meier, M. L. and Berkowitz, A. (2014). Rostral spinal cord segments are sufficient to generate a rhythm for both locomotion and scratching but affect their hip extensor phases differently. J Neurophysiol 112(1): 147-155. Keifer, J. and Stein, P. S. (1983). 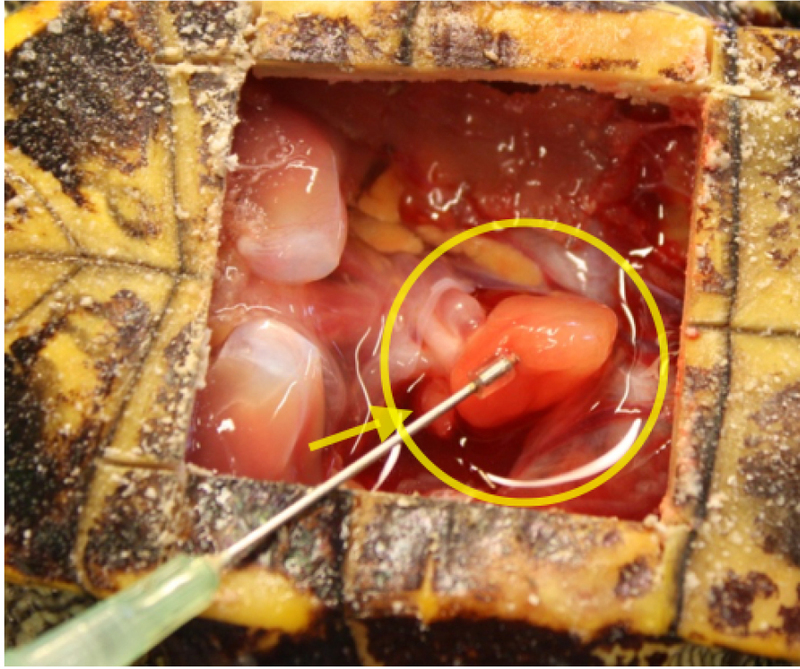 In vitro motor program for the rostral scratch reflex generated by the turtle spinal cord. Brain Res 266(1): 148-151. Kolind, J., Hounsgaard, J. and Berg, R. W. (2012). Opposing effects of intrinsic conductance and correlated synaptic input on Vm-fluctuations during network activity. Front Comput Neurosci 6: 40. Mortin, L. I. and Stein, P. S. (1989). 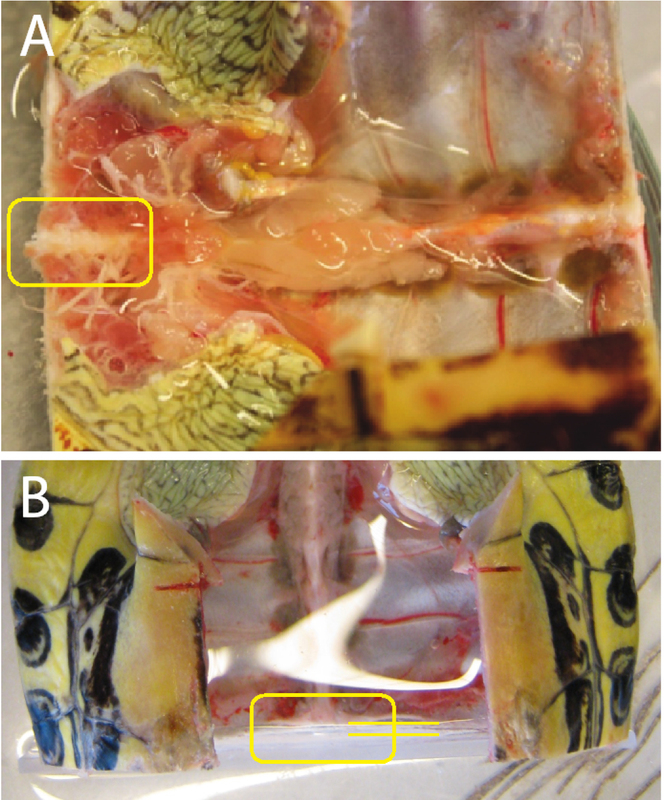 Spinal cord segments containing key elements of the central pattern generators for three forms of scratch reflex in the turtle. J Neurosci 9(7): 2285-2296. Mortin, L. I. and Stein, P. S. (1990). Cutaneous dermatomes for initiation of three forms of the scratch reflex in the spinal turtle. J Comp Neurol 295(4): 515-529. Mui, J. W., Willis, K. L., Hao, Z. Z. and Berkowitz, A. (2012). 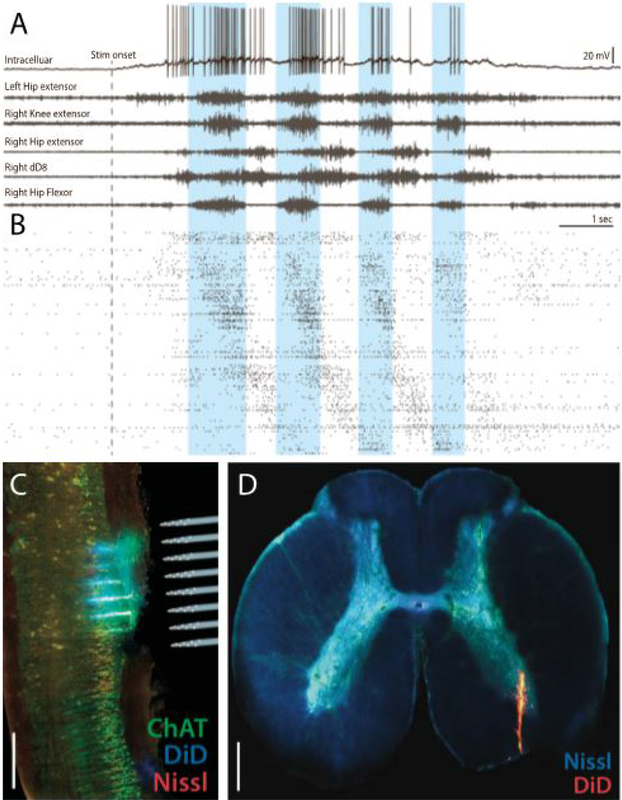 Distributions of active spinal cord neurons during swimming and scratching motor patterns. J Comp Physiol A Neuroethol Sens Neural Behav Physiol 198(12): 877-889. Petersen, P. C., Vestergaard, M., Jensen, K. H. and Berg, R. W. (2014). Premotor spinal network with balanced excitation and inhibition during motor patterns has high resilience to structural division. J Neurosci 34(8): 2774-2784. Vestergaard, M. and Berg, R. W. (2015). Divisive gain modulation of motoneurons by inhibition optimizes muscular control. J Neurosci 35(8): 3711-3723. Walloe, S., Nissen, U. V., Berg, R. W., Hounsgaard, J. and Pakkenberg, B. (2011). Stereological estimate of the total number of neurons in spinal segment D9 in the red-eared turtle. J Neurosci 31(7): 2431-2435. Copyright Petersen and Berg . This article is distributed under the terms of the Creative Commons Attribution License (CC BY 4.0).